Meerkats dwell in the savannahs and grasslands of South Africa, Namibia, Botswana and Angola. 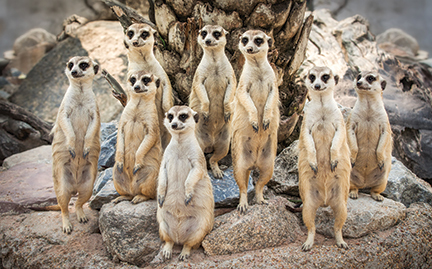 Highly social, meerkats live in three-family groups, which may consist of as many as 30 individuals. Each family comprises a breeding pair and their offspring. Meerkats are at risk from habitat loss.